When a number of crimes, for instance burglaries, can be linked to the same offender, police often plot the locations on a map. The art of finding the location of the criminal’s home based on the crime sites is a key objective in what is known as geographical profiling. 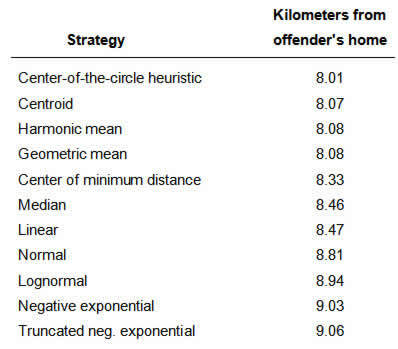 Center-of-the-circle heuristic: Predict that the offender lives at the mid-point of the line connecting the two farthest apart crime locations. The figure up top shows the heuristic applied to a set of crime locations. Note that the midpoint is the center of the smallest circle encompassing all the crimes. Ten other methods for profiling were tested, including other “spatial distribution strategies” such as finding the centroid, harmonic mean, geometric mean, or point of minimum distance. Also investigated were computationally intensive “probability distance strategies” that involve fitting probability distributions such as the negative exponential, normal and lognormal and zooming in on maximally likely cells. The 11 methods were applied to the crime locations of 16 UK residential burglars who had committed at least 10 crimes. Interestingly, all the strategies were run on a computer except for the center-of-the-circle heuristic, which was applied manually. We don’t know if that is because the crime-fighting software used is not clued into the power of the simple heuristic. As shown below, in the aggregate analysis, the center-of-the-circle heuristic made the most accurate forecasts of where the criminals lived. 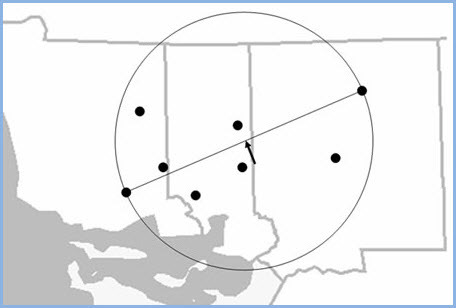 In another study (Snook, Taylor and Bennell, 2004), laypeople who were trained with heuristic methods were as accurate at predicting home locations as a computerized geographic profiling system. Decision Science News’ point is not that highfalutin statistics are bad. In fact, the more complex systems provide information that the “x-marks-the-spot” systems cannot provide, such as probable search areas. The blog merely wishes to observe that it is sometimes difficult to impossible to beat simple strategies at forecasting. Snook, Brent, Michele Zito, Craig, Bennell, Paul J. Taylor. (2005). On the complexity and accuracy of geographic profiling strategies. Journal of Quantitative Criminology, 21(1), 1-26. Snook, Brent, Paul J. Taylor & Craig Bennell (2004). Geographic profiling: The fast, frugal, and accurate way. Applied Cognitive Psychology, 18, 105-121. This is extracted from a paper the DSN editor is writing. Decision Science News does not promote vigilanteism. Yes, that is a rotated map of Rhode Island. Catch a thief with pencil and ruler was written on August 7, 2008 and filed in Articles,Research News.